Stonyfield Farm wants to be environmentally conscious -and they want to sell expensive organic yogurt but not saddle customers with a lot of liberal guilt about a container. 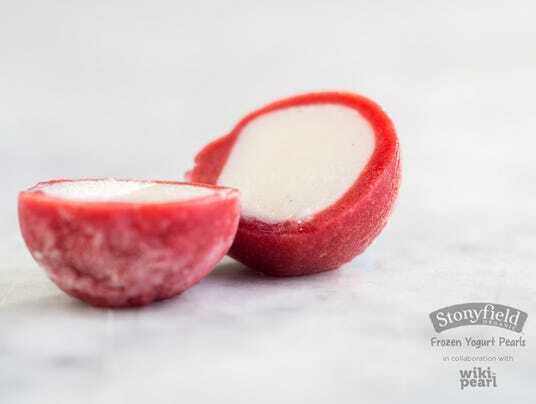 They may have done it with Stonyfield Frozen Yogurt Pearls, which is being tested in a few Whole Foods stores. The organic vanilla or chocolate frozen yogurt is encased in an edible skin flavored like peach or banana or coconut or strawberry. Co-founder Gary Hirshberg says the edible, protective skin is bound via molecular interactions between its two key ingredients, organic fruit and natural ions, whatever that means. Grapes figured this out without a lot of gibberish and there has never been anything 'organic' about them, they have been genetically modified for millenia.